Idaho’s always been good to us. Sure, there’s been a couple scraps along I-84 involving tire blowouts and the like, but for the most part, “The Gem State” has never let us down. In our initial foray into the West, we drove across the prairie like a bullet, then across the top of Wyoming, though Yellowstone, camping that night in the first town we hit in Idaho. I remember the trees and moonlight. The smell of the woods. Sagebrush! That next morning it rained hard on us in Idaho Falls, as we made our way through the Craters On The Moon. Incredible. I remember whipping by Boise, with a big cross on a mountain? Right? Is that still there? I’ll bet. 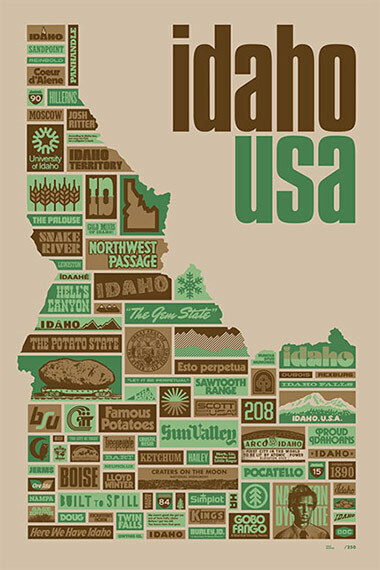 Thank you, Idaho. For years of being good to us. 01. Printed on thick, uncoated French “Madero Beach” Speckleton poster stock. Hearty, like potato skins. 02. Four colors! Browns inspired by potatoes, and the greens by “Gem State” gems. 03. 18” x 24”! Tall and mean, like the state of Idaho. 04. Proudly printed by the inkmasters of Vahalla Studios over in Kansas City. 05. You might need more clarification? Yeah? Here’s where we solve this: Click here for a bigger view, spudmunchers! 06. Just the right accoutrement for that big city Boise apartment, Doug Martsch practice space, Greg Goulet domicile, Hailey Sullivan Family compound, Burley mechanic shop, Twin Falls grade school teacher’s lounge, Coeur d’Alene lake cabin, Snake River lean-to, Mountain Home halfway house or Nampa doublewide! 07. Dedicated to Bart, Jerms, Doug, Ralf and Jack Helton. 10. Free 3” x 20” burly kraft poster tube with each order! Reusable.